Blessed are the poor in spirit. Blessed are the meek. A city set on a hill cannot be hidden. Judge not, that you be not judged. You cannot serve God and mammon. Though these sayings from Jesus' Sermon on the Mount are very familiar -- even to those who have never stepped inside a church or read the Bible -- many people, including Christians, still do not understand Jesus' real message and its implications for everyday life. Now in mid-life, Addison Hodges Hart returns -- bringing with him his own failures, regrets, joys, and sadnesses -- to sit at the feet of Jesus and listen to his words. 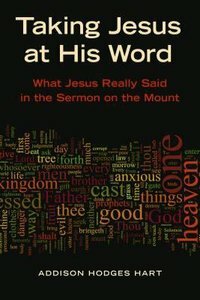 Join him as he encounters the Sermon on the Mount afresh, passage by passage, asking "How should I live the rest of my life?" This honest, accessible, and open-minded book -- drawing on sound scholarship yet free of theological jargon -- seeks to encourage and challenge a broad audience to consider anew what it means to follow Jesus. About "Taking Jesus At His Word"
Addison Hodges Hart is Parochial Vicar for the Newman Center at Northern Illinois University, DeKalb, Illinois, and a contributing editor for Touchstone magazine and the author of Knowing Darkness: On Skepticism, Melancholy, Friendship, and God.